But here’s a better way to think about it. 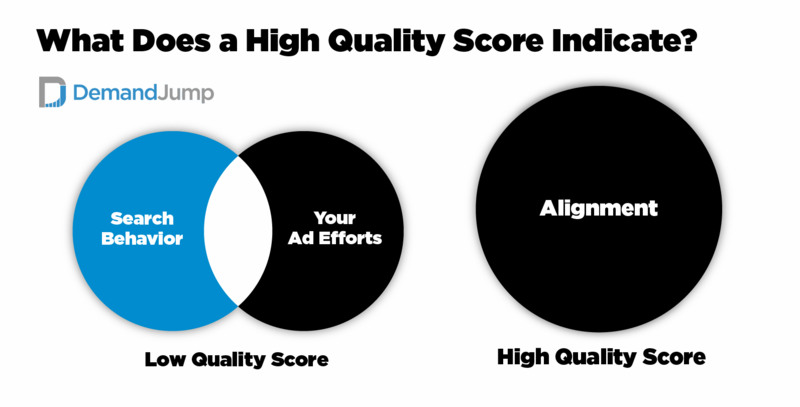 A high quality score really just indicates alignment between what people want to find and how you’re trying to sell it to them using Google Adwords. It means merging these two circles into one. If you’re interested in learning the basics of quality score and how to improve it, see the piece linked here. Achieving a high quality score results in the need to serve less ads to find the right audience. And it results in the need to pay less for your ads to be shown in the first place, because you’ve aligned your entire ad to the search query triggering it. This tells Google that you are the best ad to be shown for this query, and they’ll reward you for it. 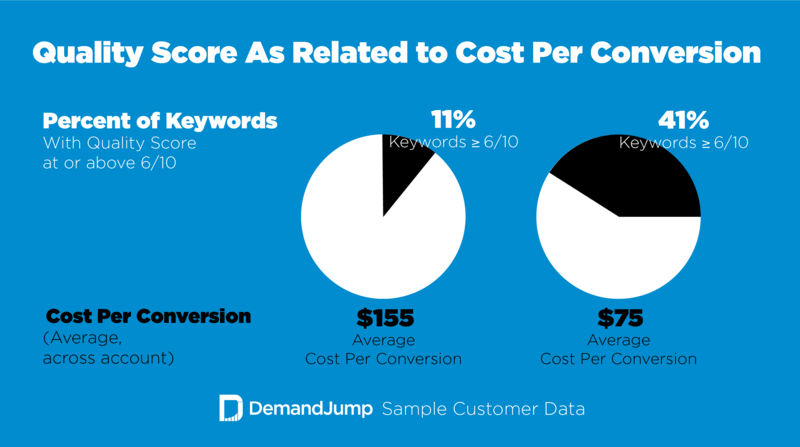 You’ll see here that by increasing the percentage of keywords with a quality score of 6/10 up from 11% to 41%, we cut one customer's average cost per conversion in half. When people see your ad, you want them to say, “Yes that’s exactly what I was searching for” instead of turning to an ad that was more aligned to their search query. A high quality score indicates alignment between consumers and marketers. It indicates that you’ve done your research, you know who you want to talk to, and you’re speaking to them the way they search Google. It means you’re showing them what they want to see - every step of the way. This concept of alignment becomes clearer as we look at each of the quality score components (expected clickthrough rate, ad relevance, and landing page experience). So here, we’ll address what alignment means to each of the quality score components. A high expected clickthrough rate indicates alignment between the keywords you’re bidding on and the words actually searched in Google. Meaning, if a lot of people are searching for, “green women’s purses” and you’re bidding on the keywords “green women’s purses,” that’s great! You’ll have achieved a higher expected CTR because you’re now showing up for words that are actually typed into Google by real consumers. But alignment isn’t achieved by simply guessing and brainstorming. To achieve alignment here, you’ll need to look into the search data. For easy wins in this area, look in your Adwords tools for terms with a high search volume but low competition. But alignment doesn’t stop at just choosing the right keywords. In order for your ads to get clicked on, consumers need to know that you’re talking about what they want. A high ad relevance indicates alignment between your ad’s copy and the terms searched in Google. If your ad’s copy includes words that are frequently used alongside the keywords you’re bidding on, you’ve achieved alignment here. For example, if you’re advertising for “dog leashes,” it wouldn’t make sense to talk about cat litter in the same ad. This term fits better into a different campaign, one specifically targeted to people searching for cat necessities. People very infrequently look for those specific pet items in the same search query. I looked at the search data in Google Trends, and there were so few searches made for “dog food and cat litter” that Google gave me this response. A high landing page experience indicates alignment between your landing page contents and the keywords your bidding on (i.e. the words people are searching that drive them to your landing page). In other words, if you’re bidding on “fishing equipment,” you better mention fishing equipment explicitly on your page, alongside words frequently used with fishing equipment. These keywords, when present in the landing page copy and in image alternative text, signal to both Google and consumers that they came to the right place to buy fishing equipment. So in short, a high quality score indicates a hyper-focused approach to Google Paid Search. When you focus (and I mean really focus) on the right search queries, and target your ads directly to the right persona, you start working smarter, not harder, in Google Adwords. If you'd like help getting your quality scores up to decrease your CPCs, we offer a free quality score assessment. Here we'll show you everything that's working (and what's not working) so you can identify your best steps forward.